It's autumn, time for the deer to rut. These two fine gents were just enjoying the warm sunshine and some fresh grass so that they could spend the night bellowing and tearing up the turf in anger. It's interesting to see the variations in coat colour although I've yet to spot a white one. That would be special. 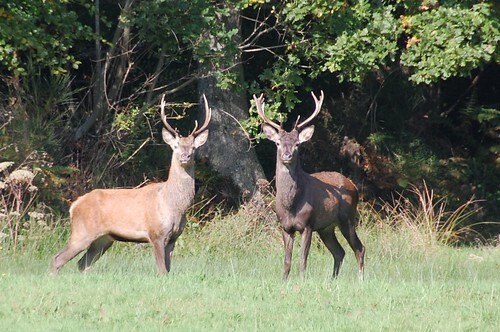 In Normandy the hunting season started a couple of weeks ago. Although hunters are not supposed to fire their guns within 50 metres of the house and I have asked them not to hunt on our land anyway I'm still somewhat nervous for myself and the cats. I feel I should wear a fluorescent jacket and keep the cats on leads with me whenever we go outside. And that's just for the casual hunters out for small game. On days when there are formal hunts in the forest dates are published, notices are put up on the boundaries and warning horns are sounded. Unfortunately living within the forest I'll only see the signs if I happen to go out, the dates are yet to be published and the horns are not very directional or helpful, still there have been no accidents here yet. Naturally as vegans we don't take part in the hunting, except for hedgehogs. Hedgehog mushrooms that is. In France these unmistakable and common fungi are known as Pied de Mouton, Sheeps Feet. 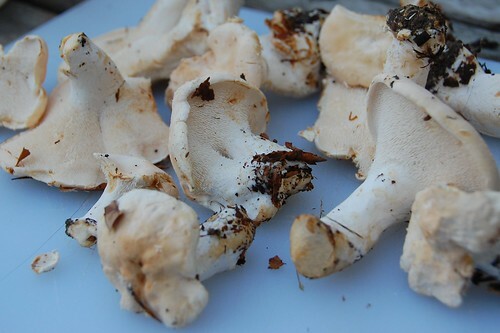 They grow under the trees close to the boundaries with fields, often in the company of chanterelles. For the beginner collecting their first wild harvests it's their spines which help to confirm that they are safe to eat. There is nothing else quite like them. We gathered a fine crop a couple of weeks ago but the freezer was stuffed full of tomato paste so I needed to find a way to use them. This Scandinavian style treatment reminiscent of pickled herring is an interesting recipe. I'll give it as I found it but if I was making it again I think I'd change things as bit as indicated. 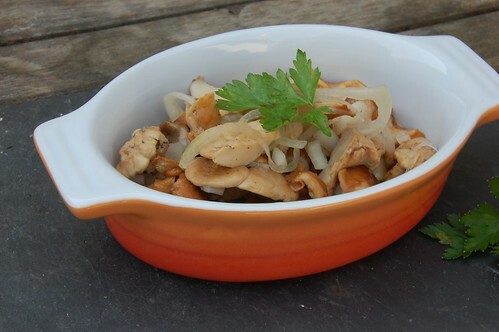 Place the mushrooms in a saucepan with water to cover. Bring to a boil, then reduce the heat and cook for 3 minutes. If I were doing this again, I'd slice the mushrooms first, drop them into boiling water and blanch for just one minute. Drain and cut them into 3-inch slices. Place in a glass container together with the bay leaf, allspice, and onion rings. I used half a teaspoon of ground allspice as it was what I had, o.k. but leaves unsightly speckles. I'd also add some black peppercorns next time. The liquid doesn't quite cover the mushrooms. Use a jar or bottle you can seal tightly and give it a good shake from time to time. The mushrooms will keep in the fridge for about a week and can be used in sandwiches, salads or in a tomatoey pasta sauce which is really good. I'm sure the same treatment would work on button mushrooms from the supermarket if foraging lets you down. Your recent posts on foraging for forest edibles have made me reflect on how it must enhance your mindfulness, appreciation, and connection with your beautiful natural surroundings, moreso than even cultivating your own food. Rose, it is wonderful to be so close to nature. Thanks for commenting. When I lived in Cornwall there was an incident when a couple of morons were shooting , illegally, in the pit out the back. Shot was coming over the garden and bouncing off the shed roof, so I know just how you feel about shooters! :) Good luck with the shooters. yummy idea for the special mushrooms or any fungi. I will try it! Thank you for your blog.